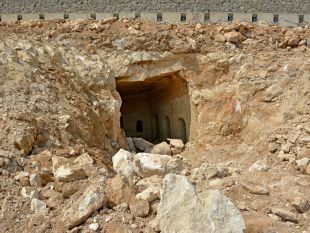 A magnificent Roman-era burial cave was fortuitously found in the northern Israeli city of Tiberias when a contractor clearing ground for a new neighborhood realized the significance of the void his bulldozer almost fell into, and immediately called in the Israel Antiquities Authority. “A good citizen,” observes archaeologist Yardenna Alexandre of the IAA. The underground mausoleum unearthed this month is between 1,900 to 2,000 years old, judging by the architectural style, she told Haaretz. The main central chamber has several burial niches – shelves carved into the cave walls, and a small inner chamber. 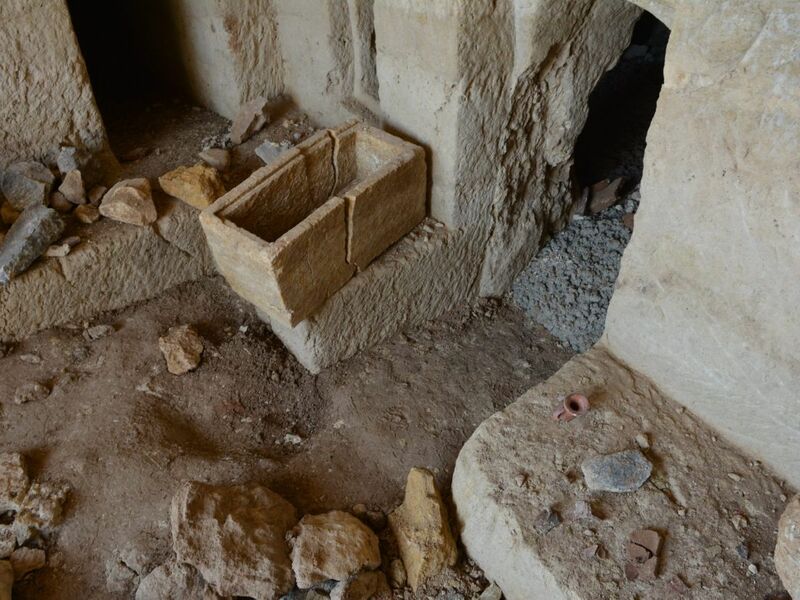 The archaeologists also found ossuaries, which are boxes used for the secondary burial of bones. 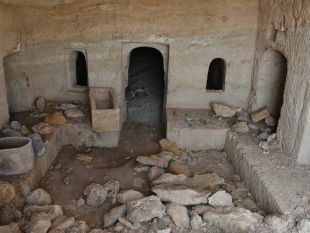 That means the bereaved would lay the dead on niches carved into the cave walls, and wait for the bodies to decompose. Then the bones would be reburied in boxes typically made of stone or clay that were only as long as the longest bone, Alexandre says. The ossuaries, which were made of stone and pottery, are the tell-tale artifact marking the catacomb as belonging to Jews. Nobody else is known to have practiced secondary burial in the Roman era – with one exception. 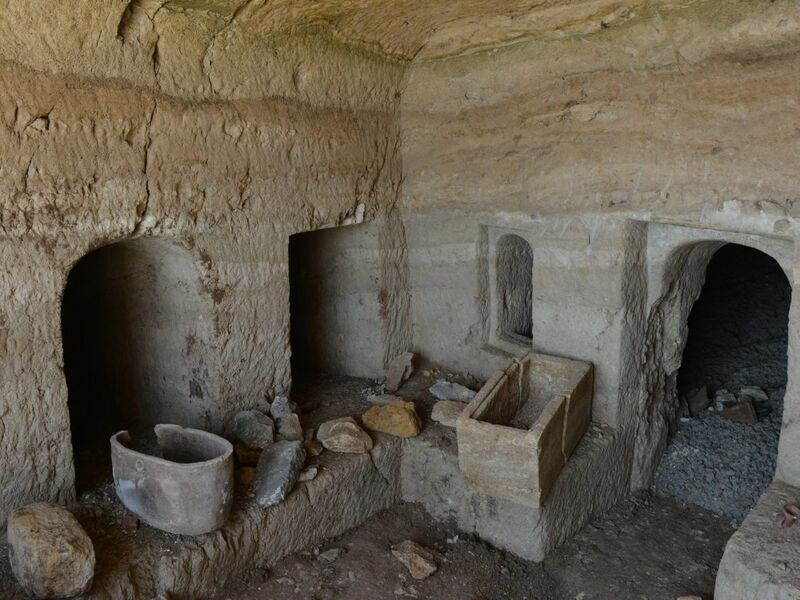 “One single case is known in Israel of a non-Jewish secondary burial in an ossuary – a Nabatean. Maybe it was a Nabatean who was influenced by the Jews,” remarks archaeologist Dr. Mordechai Aviam of Kinneret College. 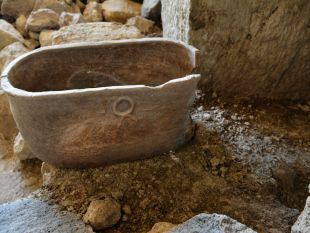 It is true that there is much older evidence of secondary burial in pottery ossuaries, but that’s from the Chalcolithic period – also known as the Copper Age, which is before Judaism existed. For some reason the practice arose anew thousands of years later, in the 1st century B.C.E., and vanished once and for all in the early 3rd century. The underground mausoleum in Tiberias' north had been skillfully carved out of the yielding limestone, possibly starting from a convenient rain-carved depression in the bedrock. Its walls were decorated with colored plaster, as was the custom at the time. More information will have to await proper excavation, which has not begun yet, Alexandre stresses. But meanwhile it can be said that the archaeologists also found the names of the dead, carved onto the ossuaries in Greek. Jewish names in Greek on graves in the Holy Land? Absolutely. It was very much the practice. Half the graves in ancient Jerusalem from the same era are also inscribed in Greek, Aviam says. Other inscriptions found in Tiberias itself, linked to Jews from the 3rd century, were in Greek too. Greek inscriptions also decorate ancient synagogues found across the Holy Land, including one found in Tiberias. The sage Abbahu who lived in Israel from 279 to 320 and who had studied in Tiberias famously spoke Greek as well as Hebrew. “It’s just like Jews in Brooklyn today pray in English,” Aviam points out. But if the Jewish burial cave in Tiberias dates to the 1st or even the early 2nd century, there’s a snag. At least according to the Jewish-Roman historian Josephus, Tiberias wasn’t supposed to have Jews yet. Tiberias was founded in the year 18 by the Jewish vassal king Herod Antipas, son of Herod the Great, on the banks of the Sea of Galilee. Herod Antipas build it as his capital and named it as a submissive gesture to the irritable incumbent Roman emperor Tiberius. As said, Herod Antipas built Tiberias from scratch as an entirely new Roman city-state, which has led to an intriguing conflict of opinion between Josephus and contemporary researchers. Josephus, who was originally named Joseph ben Mattathias and who wrote quite a bit about Tiberias and nearby Sepphoris (Tzipori), says that Jews were squeamish about moving to newly-established town because it had been built partly over ancient graves. (And maybe it was; Jewish tradition says Tiberias was built in part on an even older village.) Because of the tombs, the land was unclean, says Josephus, and Jews shunned the city until purification rituals had been performed. First of all, Herod Antipas may have been a toy-royal of the Roman emperor but he was also the Jewish king of the Galilee, a predominantly Jewish area. So if he built a city in the Galilee, Jews would have moved in too, Aviam argues. Secondly, the issue of the ancient graves is circumventable, in his opinion. “Today the state simply pours money onto the problem,” says Aviam: if it wants to build a new neighborhood or highway and graves pop up, so to speak, it builds tunnels or bridges or just builds anyway. Back then, in the 2nd century, the answer lay in rituals - possibly devised by the 2nd century sage Simeon Bar Yochai, who counseled the Jews after the Romans destroyed the Second Temple in 70 C.E., Aviam says. The rituals were supposed to either cause the ancient graves to sink deeper into the ground, preventing contamination of the living, or rise higher so the dead could be reburied elsewhere. In any case, Aviam points out, at some point the Jews clearly circumvented the problem of living atop the dead because in the 2nd century, Tiberias greatly expanded, and yet again the issue of building on graves would have arisen. Since the city became central to Jewish life of the time, evidently the Jews were solving this conundrum. Aviam further speculates that the deceased dwellers of the burial cave weren’t among the very first Tiberians. Most likely Herod Antipas peopled the city with low-status workers at first, and elite classes would have come later, possibly from the second half of the 1st century onwards. Among them would have been multicultural Jews speaking Greek. Or, the cave might not have belonged to Tiberians at all. 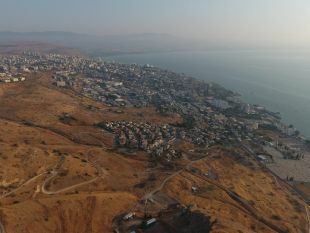 Aviam notes that it is nowhere near ancient Tiberias, so either the Jewish family in question had quite a trek to the site, or they didn’t live in the city itself but in a nearby village. If human remains are found, more can be said. The cave has yet to be excavated, Alexandre stresses, so we do not know at this time whether anybody is there. Also, it is very likely the cave has been robbed of any valuables long ago. Carved stone doors stood at the entrances into the rooms, which nobody can see because the authorities lost zero time in blocking the cave off to protect it from future grave robbers and vandals.